Ocean plastic pollution is a global problem and one of the greatest threats that our oceans face. Up to 12 million metric tons of plastic enter our oceans every year — that is the equivalent of a garbage truck's worth every minute. Studies show that up to 90% of seabirds now have plastic in their stomachs. We need to act urgently to stop plastic getting into our oceans. And we're calling on Coca-Cola — the world's biggest soft drinks company — to lead the way. Coke produces over 110 billion single-use plastic bottles a year — the equivalent of over 3,400 bottles per second — and as one of the world's biggest brands, Coke has the power to change how its industry operates. We're calling on Coke to phase out single-use plastic bottles and invest in new alternatives. It can't be left up to consumers to solve the problem of plastic pollution. We can't simply recycle our way out of this mess. Coke needs to take responsibility and tackle the problem where it starts — their own production. 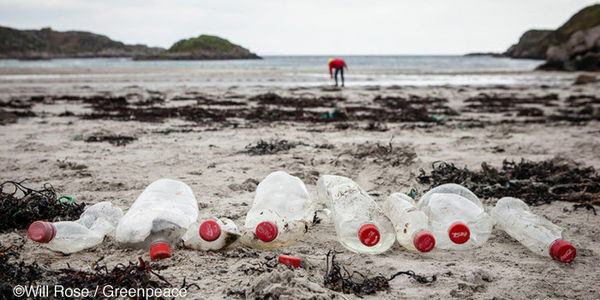 Sign the petition and tell Coca-Cola's global CEO: our oceans can't stomach any more plastic.